Like every other industry, the food industry has also started booming with a full sway. The significant development of technology has not only helped the restaurants and food delivery business strengthen their profit line, but has enabled the sector to mount up like never before! When the food line has managed to appear as a highly profitable industry due to its wide potential and highly growing demand for restaurants of different food themes in various cities, it has also become able to cater to the specific needs of the customers in the best possible manner. Ever since technology started playing a vital role in redefining the food business in India, the restaurant industry has attracted many people over the last few years. Almost each and every restaurant is established to offer customers a highly satisfying and a convenient experience. Admittedly, the growth of any business depends on upon the revenue generated by operating it. Information technology solutions should always be used in your business to enhance the overall performance, efficiency, quality, and customer satisfaction. Customers seem to have developed a fascinating image as far as technological integration is concerned. It has made things easier for them to get done with menu viewing and ordering activities. So, as a wise restaurant business owner, you should always take recourse to some good mobile app development company in the USA, as it will not only enable you to improve the quality of customer services but will also make you go beyond the limitations in reshaping your business. Every business owner in the restaurant sector strives to have a highly organized mobile application and impressive online presence so that they can attract a large number of people within a short span of time. So, why should you be a deviation in this regard? There are several applications that allow people to place their orders using digital menu cards. This not only allows the end users to place their order without much hassle but also makes the entire affair happen with just a few clicks on their phones.Many restaurants already have the same facility for their mobile applications, but few of the restaurants have their digital menu cards uploaded on a mobile application. It allows customers to choose the food item just in a jiffy. Also, you can choose a restaurant according to your budget and preferences in terms of food items. Online delivery is a bliss indeed! Isn’t it? Fast food chains will also eradicate the mediator’s role in booking orders, as they will allow the end users to book their orders over the online platforms and mobile applications. It will not only make the food ordering easier for your customers but will also make them trust your venture yet more. Moreover, with the use of GPS technology, the restaurant owners can also keep a track on where the deliverer is, thereby fortifying the entire process as well. The trait of online seat reservation would definitely be a boon to you! 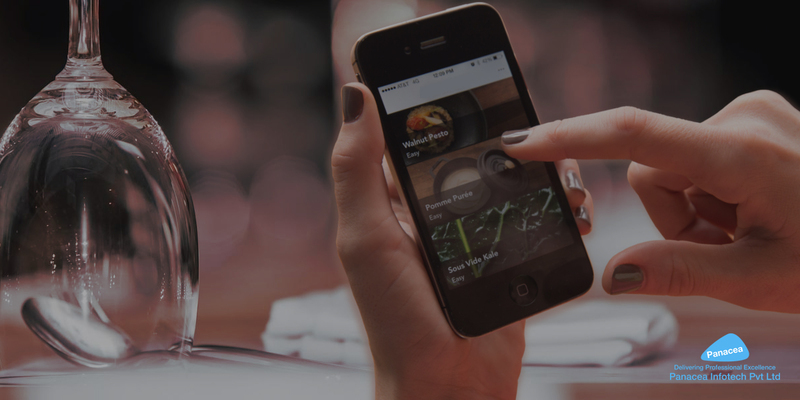 There are a number of mobile applications that connect users with the closest restaurants and provide them with the required details to mark the table. And, unless you are having a mobile app for your restaurant business you never be connected to such requests. Such awesome quirks also enable the end users to book their slots or determine whether it has a free table or not. It would also reduce traffic congestion in front of the restaurants, thereby giving all your potential customers a positive impression about your restaurant business. At the same time, a good mobile app development will update your customers with every relevant information including special offers, discounts, and attractive deals. No matter whether yours is a start-up or you have been running the business for a long time, it is really important to have an active online presence on social media sites like Facebook, Twitter, and Instagram to keep on going ahead with the changing trends. When it attracts an end number of heads in a short time span, it also improves brand value and its image. Moreover, researches say that most of the customers get to know about new restaurants on online platforms only. Therefore, you should always make sure you have an active online presence. And, nothing can be better than a good mobile application development that will always allow you to interact with the customers directly and respond to their feedback. Online reviews would multiply your revenues like never before! Most of the quality food delivery apps like Gayot, Yelp, Dine, and Zomato allow their customers to give individual feedback or opinion about restaurants’ services on their websites. And, customers are often reliant on such rating or reviews to decide whether they want to visit the particular resto or not. So, quite naturally, if you are rated well on one of these websites, the chances for your potential customers to visit your restaurant get multiplied to a significant extent. Similarly, these websites also allow the restaurant owners to plan their activities to perk up customer services according to the reviews given by the customers. Panacea Infotech is one of the best mobile application development companies in the USA, providing amazing user experiences on iOS, Android and Windows platforms that help you get a move to your business growth. So, if you want your customers to connect with you anytime and provide them with the most convenient way to order their favorite food from your restaurant, we come up with a one-stop solution.